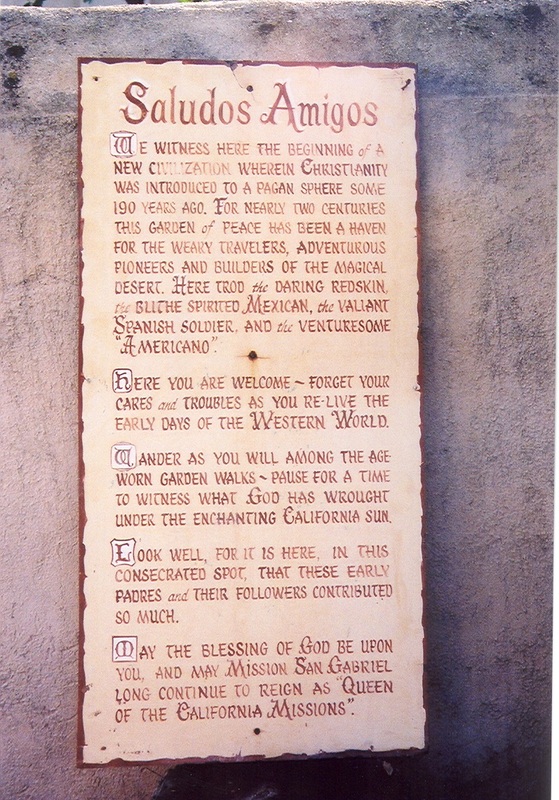 During late ’02 and most of ’03 we set ourselves the project of visiting all of the 21 Alta California missions. We were centrally located just about halfway between San Diego, the first and southernmost, and Sonoma, the last and northernmost of them. We’re not religious, but I’ve always enjoyed churches architecturally and as places of contemplation. And we’re history buffs, we like to visit anything that’s old … and in California the missions are about as old as it gets, except for Indian artifacts. 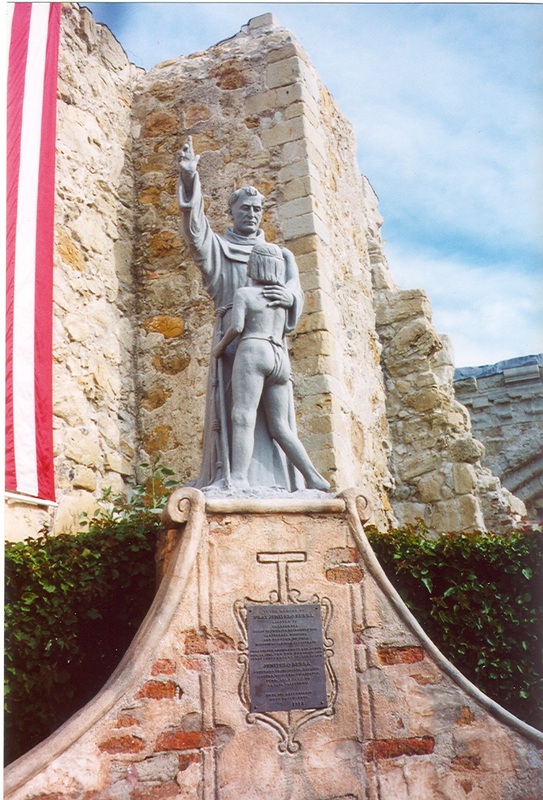 They were established beginning in 1769 by Junipero Serra, and then by Fermin Lasuen. Their purpose was to civilize and bring Christ to the Indians. What they really brought was slavery and disease, but hey, at least their souls were saved. They were intended to be one day’s horseback ride from each other, and they are spaced just about right for that. 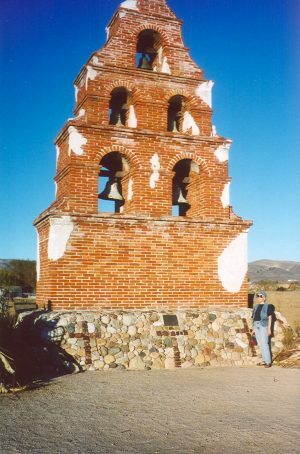 During the 1830s Mexico, which owned California before the Americans stole it from them, “secularized” them, trying to lessen the influence of the Catholic Church. After America took California they were returned to the Church. By around 1900 most of them were in ruins to one degree or another. During this century there has been much restoration. Some are now gleaming, functioning churches. Some are State Parks. Some are not much of anything. What follows is not meant to be a history lesson. There could even be some stuff in here that is wrong. No, this is simply my own idiosyncratic impressions of our visits, colored by many things, including how I felt on that day. 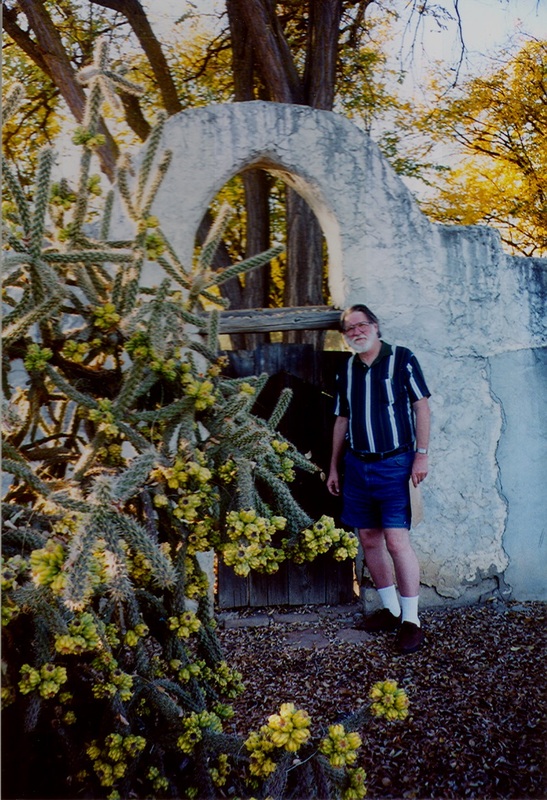 If you want to learn more, follow the links that Lee has provided. They are listed more or less in the order we visited them, in the course of half a dozen major trips and many shorter ones. 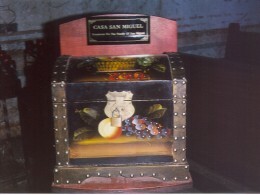 1) SAN MIGUEL ARCANGEL. 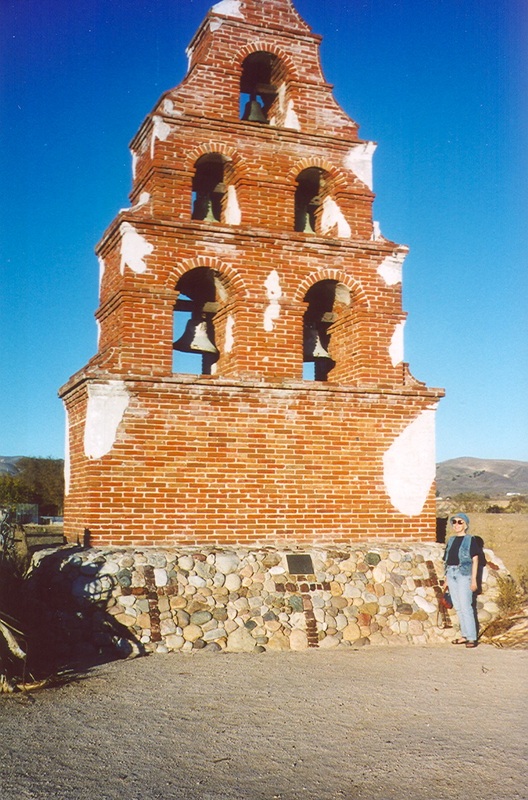 Seven miles from our front door, the 16th mission to be built and the first we visited. A good place to start, as it is on the edge of a small, impoverished town and hasn’t been commercialized much. 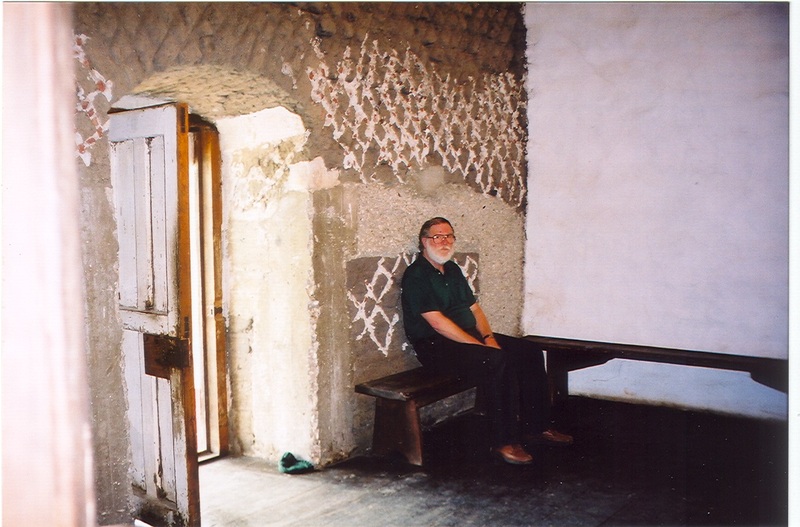 Unlike many, the original church building survived, with the original frescos on the walls. 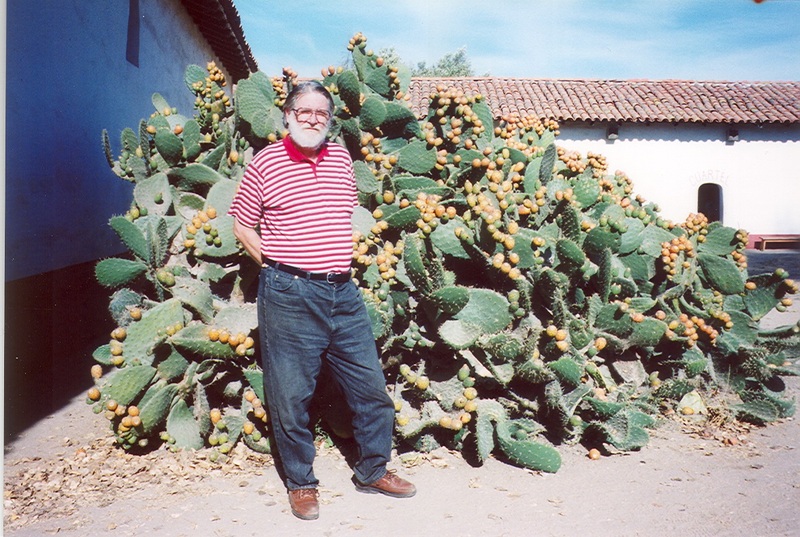 The roof has leaked a lot over two centuries, and the place is dank and gloomy inside, dry and dusty outside, with astonishing growths of cactus. 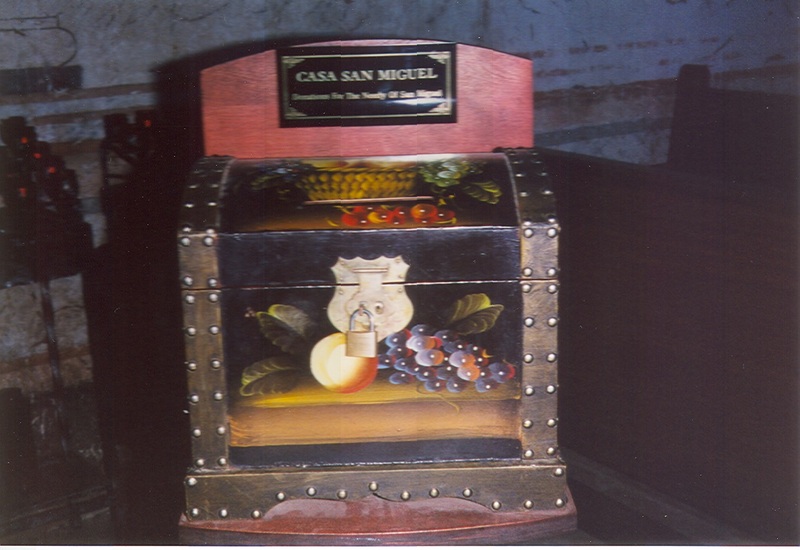 Oddly, San Miguel was one of the most prosperous missions when it was in business. You wouldn’t know to look at it now. 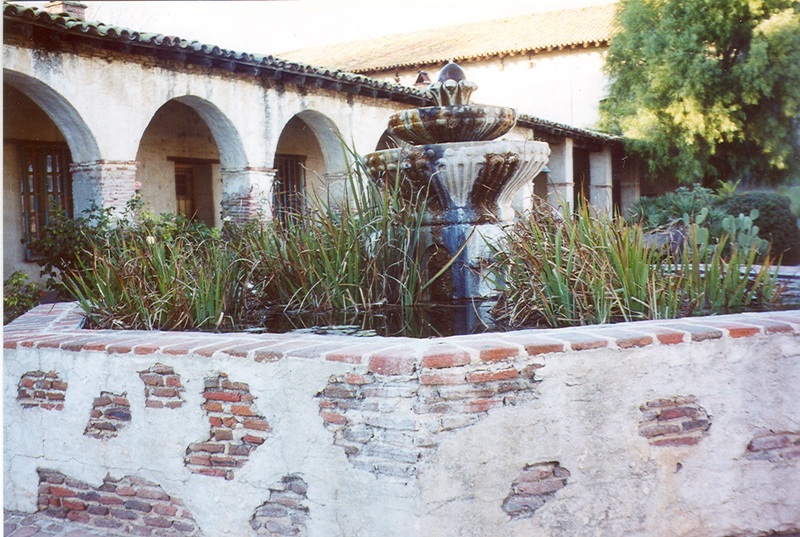 It is estimated that $50 million dollars are needed to preserve and earthquake-proof the California missions, and about $10 million of that is needed just for poor little out-of-the-way San Miguel. Any kind of good shake would bring it right down, no question of that. It’s one of our favorites, both because it was our first and because it is miles more authentic than most of them. I hope someone does something soon, but with the Cahleefornia budget crisis and the federal deficit I wonder if it’s going to happen. 2) SAN LUIS OBISPO DE TOLOSA. (Bishop of Toulouse) Thirty miles south of us. Basically nothing is left but the church, and that is a replica. This was the first mission to use the familiar red clay roof tiles … because the Indians kept burning it down when it had a thatched roof. Pretty much destroyed by earthquakes more than once. 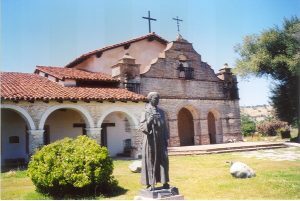 It’s a working church, extremely clean and neat, and the surroundings are nice, in the middle of small-town San Luis Obispo. But all in all not a very interesting link in the chain. 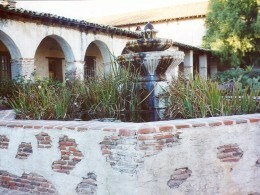 3) LA PURISIMA CONCEPCION. Near Lompoc, another very prosperous mission, after they moved from the original site, flattened by the Quake of 1812, which seems to have hit at least a dozen missions very hard indeed. Fell into ruins, and then FDR and the CCC came along. They rebuilt it using only original methods and materials, even the three-mile aqueduct that was key to the success of the place. 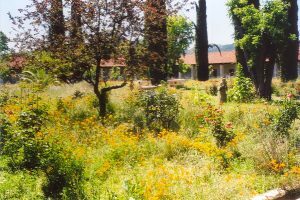 Now it looks pretty much as it must have in 1820 or so, complete with poultry, cattle, and swine, and a restored garden growing more varieties of herbs and edible fruits and leaves than I even knew existed. This is one of the jewels in the crown of the missions. 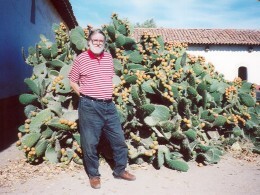 SECOND VISIT TO LA PURISIMA. Our favorite mission has “Mission Days” twice a month beginning in March. 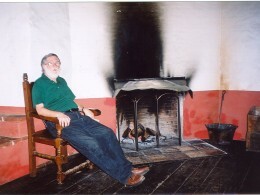 Local volunteers called “Prelada de la Tesoros” (Keepers of the Treasures), trained in mission lore, dress in period costume and we all pretend it is 1822. 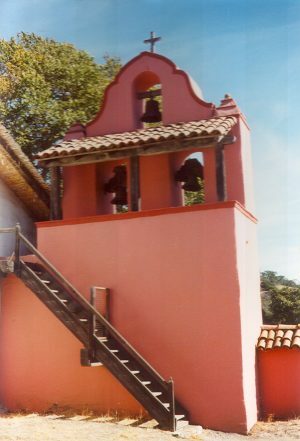 We were greeted in the church by the padre, who inquired whether we were coming up from Santa Inez or down from San Luis. Next we encountered one of the six soldiers of the garrison. He showed us how he makes the .75 caliber lead shot to go in his Brown Bess rifle. He said that with a flintlock like that, if it’s raining you’re better off with a bow and arrow or a lance, his weapon of choice. But if he hits something with that ball, it will go down. Juan made us a nail from an iron rod. He worked fairly quickly, but it took maybe five minutes. Really drove home just how tough even the most ordinary tasks could be in 1822. How many homes do you think would be built in this country every year if they had to make every nail by hand? We met an old ship’s captain from Boston, who had “actually” brought Juan’s raw iron around the Horn. He was dozing on the arcade, and somebody told us he’d been drinking entirely too much of the local rum. Probably needed the fortification for that long, terrible voyage home. We were also warned there were six mountain men of “questionable moral character” hanging around, and we saw one of them, but he seemed harmless. We had a great time at Mission Days. 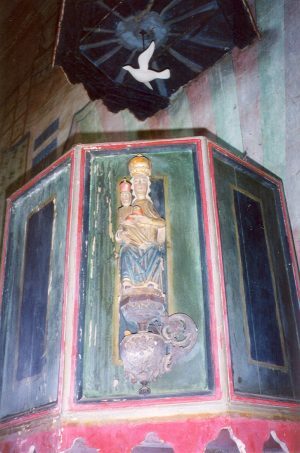 5) SAN ANTONIO DE PADUA. Off the beaten path. Actually, located on the grounds of Fort Hunter Liggett. We almost missed it (hint: when looking for a mission, if you see a “Mission Street,” turn there…), driving past many square miles of obstacle courses and what I finally figured out was a tank training ground, like the world’s biggest, coolest sandbox, with full-sized toys. We had to drive through a maze of post 9/11 concrete truck-bomb retarders … right, I’m sure Hunter Liggett is real high on Osama’s hit list … and a sentry who wrote down every detail from my drivers license. 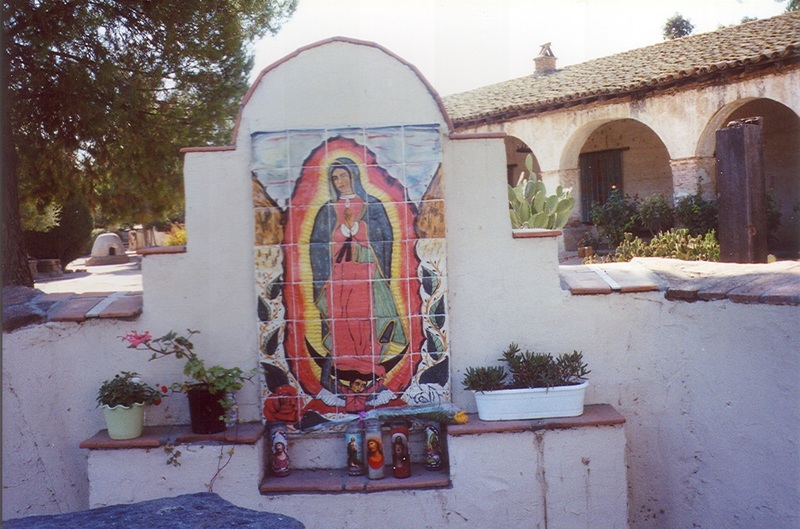 Finally, the mission … which, due to its isolation, wasn’t looted much during the days of forced Mexican secularization, from 1834 to the 1840’s, when the government stripped the church of most of its possessions. 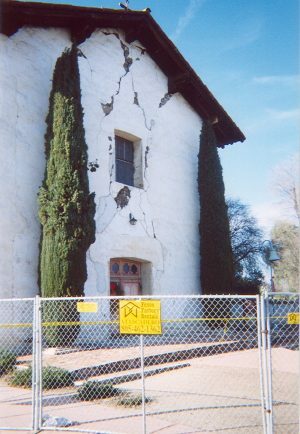 Secularization often finished what quakes and Indians hadn’t been able to destroy. San Antonio is well preserved, a good one to visit. And as one of the most isolated, you get a nice idea of what it must have been like when this was the only building for 50 miles. 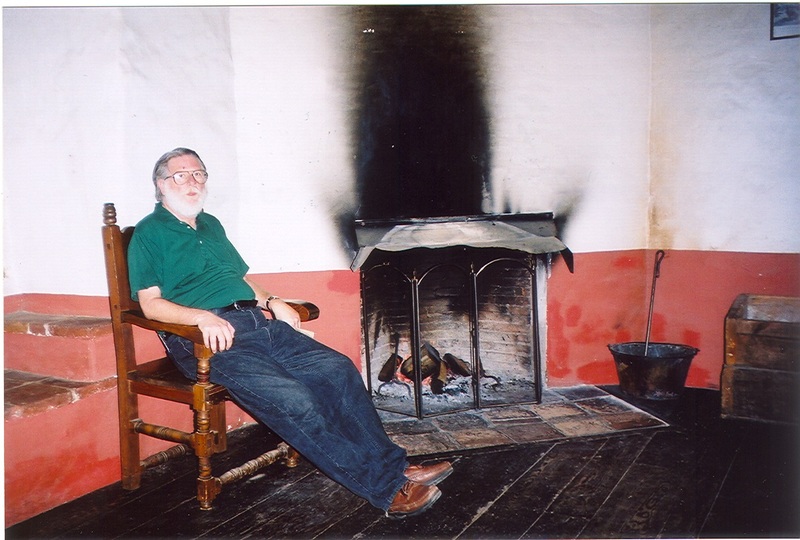 You’re unlikely to have to fight crowds; the first time we visited we were the only visitors. On our way out, we saw a coyote crossing the road on the army base. 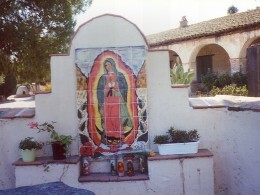 7) NUESTRA SENORA DE SOLEDAD. 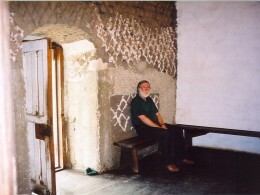 (Our Lady of Solitude.) I think of this as the hard luck mission. Things never did go right here. 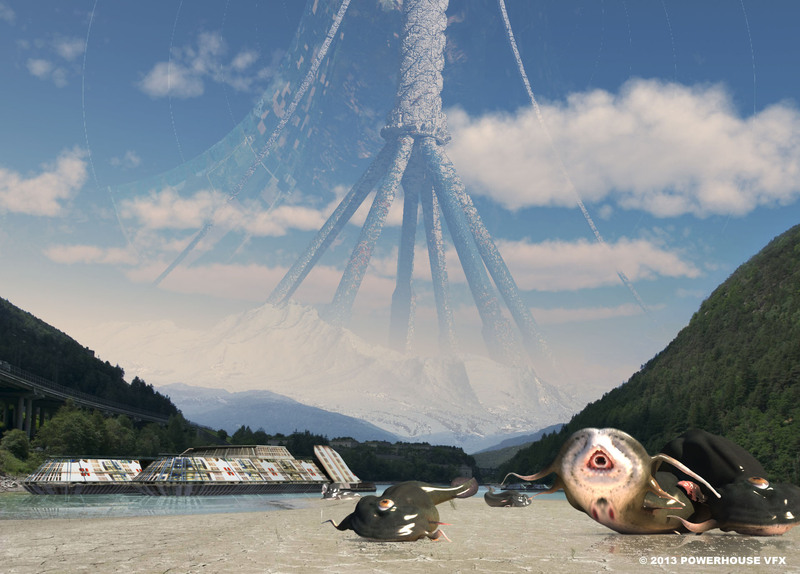 It was repeatedly destroyed by floods, of all things. Most of the Indian slaves died from plagues. By 1859 there was nothing left but ruined walls, some of which can still be seen. Fifty years of restoration efforts have produced only the small chapel, featuring a dolorous statue of Mary dressed in black, and a small residence wing. No big grand church building, no grounds to speak of. I almost felt sorry for the woman who ran the forlorn little gift shop. Right next door lines and lines of laborers were boxing a huge field of romaine lettuce at astonishing speed. It sure looked like hard work. Several dozen black and red chickens scratched out a living under some stunted orange trees. Depressing.